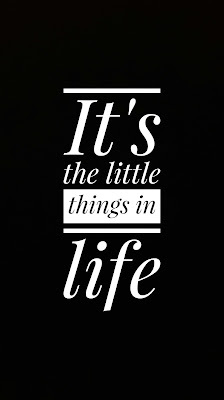 Lately I thought a lot about the quote: "It´s the little things in life", as a pic with this quote is my wallpaper on my smartphone at the moment. 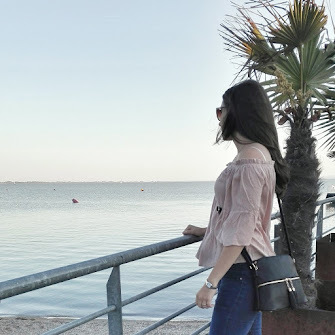 For me quotes are something great, something which sometimes inspires me or which make me more thoughtful about things, but there are also some quotes that I don´t agree with. But this quote is definitly true for me. Most of us are very lucky, because we are healthy, we are not as poor as most people in the world especially in developing countries, we have homes to come back to, we have work, families, friends. Sure everyone of us has her/his problems, me too-- I have already been through very tough times. But in conclusion we are very lucky, because we have what so many people in this world don´t have. I often see that we, who nearly have everything, don´t appreciate the little things in life. Isn´t it sad?! It is normal for us to have all these things, and we are always searching for more and are not satisfied with little things because we always want to have more and better things. We are searching for more and more money, for more sucess, for more wealth, for more new technical innovations. For sure these are nice things, and there is nothing wrong with it until we are thankful. Thankful for everything we have, not only the big things, also the small things that make life wort living. In my opinion the most important things in life are the little things, like wonderful and happy moments with people that we love, that we have a warm home to come home to after a stressful day at work, where we can feel totally comfortable, which is our "safe place" when everything is too much for us. Having friends who always support us, no matter what comes, who are always here for you. These little moments, like spending time with my family are the most important things for me, because I think in the end these are the moments that we are thinking back to and not all the things we had reached and bought. I will for sure be thankful for the great people I met, for the laughs I shared with my friends, for every second with my family, for my great and warm home, because that is so much more important and that makes me happy at the end. "It´s the little thing in life"
What is your point of view at this topic?